The Rabbit is one of the most universally known of the Chinese symbols as it is a harbinger of tremendous luck and good fortune. Those born in the Year of the Rabbit are revered as one of the luckiest signs of the Chinese Zodiac. 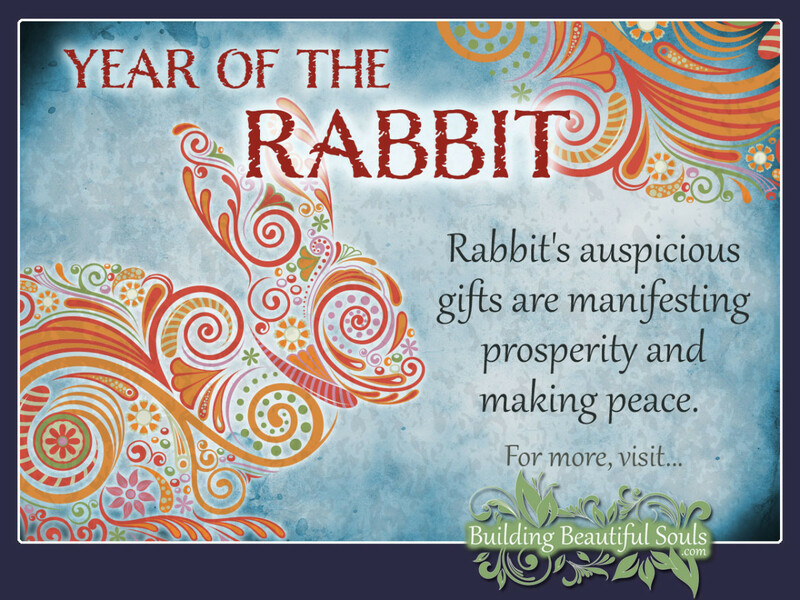 The Chinese Rabbit will live a long, peaceful life filled with beauty, love, and much prosperity. Rabbits rarely let anything standing in their way. They are agile thinkers and movers who will find their way over, around or under any of life’s roadblocks. If anything or anyone does, perchance, defeat them, the resilient Rabbit will bounce back almost immediately. Chinese Rabbits are associated with the moon from where, it is said, that they gather all their special qualities. Non-judgmental, sympathetic (even eerily empathetic) and open-minded, Rabbits seem to draw a crowd of followers wherever they go, many of whom are seeking the sage advice only the Chinese Rabbit can offer. This Chinese zodiac animal is a seeker of peace and detail oriented in the extreme. They will do everything in their power to avoid conflict and will leave not even the tiniest element of a project unfinished once begun. While those born in the Year of the Rabbit makes good friends, they will not be willing to “go the distance with you”. And don’t let their sweet, gentle demeanor fool you. They are laser sharp business people who have a steel will when it comes to getting what they want. The Chinese Rabbit is renowned for their charming and gracious manner. On the flip side, they are self-centered people who will immediately eliminate anything or anyone that demands too much of them and their perception what is “too much” has a very low threshold. When interacting with an arch enemy, the Chinese Zodiac Rabbit will be convincingly polite. Inside, however, they are hatching a plan to destroy their nemesis in the most malicious means possible. Scroll down to find your birth year. This will tell you which “type” of Chinese Rabbit you are and help you to learn more about how the combined energies of the fixed and secondary element impact your life. The Water Rabbit makes a terrific psychic, medium and medical intuitive. Incredibly sensitive and empathetic even the smallest bit of conflict causes them real pain. Those born in The Year of the Water Rabbit are so generous and sweet, they must take care not to let others take advantage of them. At their darkest, they can lapse into deep depressions, become convinced everyone is out to get them and withdraw to such an extent that they almost disappear. The element of fire gives the docile Chinese Rabbit some sass and strengthens their backbone. The Fire Rabbit can be more emotional than the other elemental types and they do show more emotion than the rest but still couldn’t be called demonstrative. Those born in The Year of the Fire Rabbit have far more ability to be leaders than the other Rabbits but will lead with diplomacy. The Metal Rabbit has a stronger emotional, mental and physical constitution than that of the other types of Chinese Rabbits. When they commit to something or someone they are inflexible and unwavering in their pursuit of both; but no one will ever be able to read these emotions on the face of a Rabbit because they’ll be smiling while they (in the nicest way possible) mow over everything and everyone standing between them and what/who they want. Those born in The Year of the Metal Rabbit have a deep love of beauty in all its forms. The Wood Rabbit has a double wood-whammy because the Chinese Rabbit’s fixed element is wood. Generous and sympathetic in the extreme, they will give till they, literally, have nothing left emotionally, mentally and physically. In business they will steadily work their way to the top but their innate fear of conflict makes them unsteady because they are not capable of taking a stand. In this, Those born in The Year of the Wood Rabbit should take care their indecisiveness doesn’t cause harm for themselves and others. Those born in The Year of the Wood Rabbit are the most grounded of all the Chinese Rabbit types. Pragmatic and conservative they will spend considerable time calculating every move they make. All Chinese Rabbits love luxury and fine things but for the Earth Rabbit materialism is almost a religion. Though very self-centered, this Chinese Rabbit is the one most prone to active self-improvement. Further, Earth as their element makes this Rabbit less emotional than their brethren. The Chinese Rabbit needs a partner who pampers them and who shares their sense of style and gracious demeanor. As a partner, the Rabbit will seem distant as they are very private, almost secretive, but, underneath, they are loving, highly sexual and very capable of mating for life. Additionally, the Chinese zodiac rabbit loves large families and will try hard to have their own or marry into one. For best zodiac compatibility, The Rabbit’s best options are The Chinese Pig and The Chinese Sheep. Chinese Rabbit children are sweet, sensitive and not prone to emotional outbursts. They are born with a heightened survival instinct and use their uncanny intuition to avoid even the slightest bit of physical, mental and emotional discomfort. Though these children will seldom be openly defiant they, even at the earliest of ages, have incredible strength of will and tirelessly negotiate to get what they want.